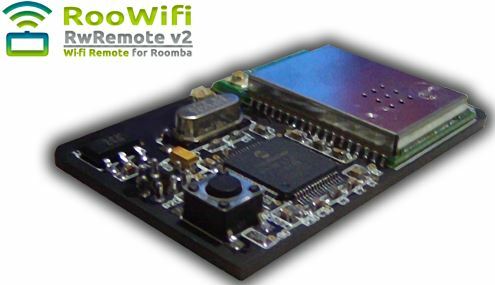 Today we will talk about Roowifi device, a small wireless controller for Roomba. First, let’s talk about the cleaning robot. It is a vacuum-cleaning robot that is revolutionizing households worldwide. It is completely autonomous, automatically cleans your home effectively and completely. The vacuum cleaner robot knows when to switch on, when to stop and when to return to its small station to recharge the battery. The strength of the Roomba is that it uses a patented 3-stage cleaning to clean the floor effectively allowing it to collect a lot of dust, dirt and debris. It has an integrated storage without a bag, which can be easilyemptied after each cleaning cycle. It is perfect to clean under furniture. Currently, the latest version is iRobot Roomba 780. The dimensions of the robot are 35 cm in diameter and a range of 120 min. It vacuums and brush every kinds of floor avoiding obstacles thanks to its integrated intelligent system. This version has an improved brushing module and an optical dirt detector. iRobot Roomba 780 is a little cleaning genius and is equipped with iAdapt technology that analyzes the surfaces to be cleaned to achieve a unprecedented quality. This Roomba 780 version includes a power management program: the battery life is optimized in this way up to 50%. This practical model is programmable to start cleaning your home at any time you want. Another feature is that carrying a bag so you never have to worry about him as even is exchanged automatically at its base. 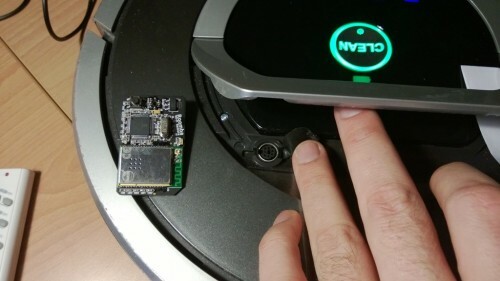 It is a device/plugin, which allows you to control wireless your Roomba through a computer, mobile phone, or tablet. This device is needed to integrate the robot to your home automation system. 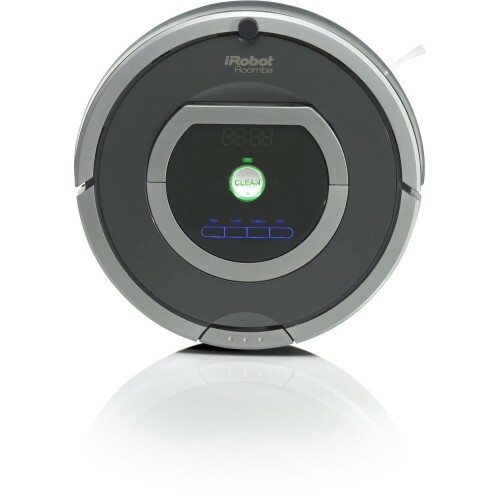 Roomba-Wifi is compatible with any Roomba 500 and 700 series manufactured by iRobot. Anyway, to be sure if it is compatible enough, just remove the top cover and check that your robot hasa PS/2 connector. Roowifi allows developers to create their own apps for smartphones, tablets, PC and MaC, communicating with the robot without requiring additional cables. The connection and communication with the Roomba is done by mini-DIN 7 connector PS / 2 located at the top of the robot. Roowifi communication protocol used SCI (Serial Command Interface) developed by iRobot. The parameterization of the communication speed is set automatically during Roowifiboot process. RooWifi can operate in three different connection modes: Hotspot (Ad Hoc), home networking, and reconfiguration (transient). If you are not a developer, but a single user, don’t worry: this device is also designed to be used from the couch, computer, mobile phone or tablet, to control the cleanliness of your home without any effort, and it would only be necessary to have Wi-Fi at home. WiFi Module for iRobot Roomba robot vacuum cleaner. Reset button to reset to factory settings. 3 modes of Wi-Fi LAN connection. Sending commands Clean, Spot and Dock for GET requests via AJAX URL. Reading data from the sensors in XML or JSON files. API available on June 15, 2013. Compatible Android (version 2.0 and higher), Blackberry, Windows Phone, Wi-Fi connectivity sites. Compatible Linux, Windows and MacOS. Compatible with Roomba 500 and 700 series. I'm Technical Surveying Engineer. When i finished my career, i decided to do a Master's degree in Digital Home and robotics, in which, I'm addicted to home automation .Thanks to the Master's degree, I'm doing practices in the company Domótica Davinci.